this album was back when their sound was different, when they were not much more than a college band with a distinct talent for blending rock with boogie-woogie. The sound is much more raw and immediate, and not nearly as slick as it was to later become. 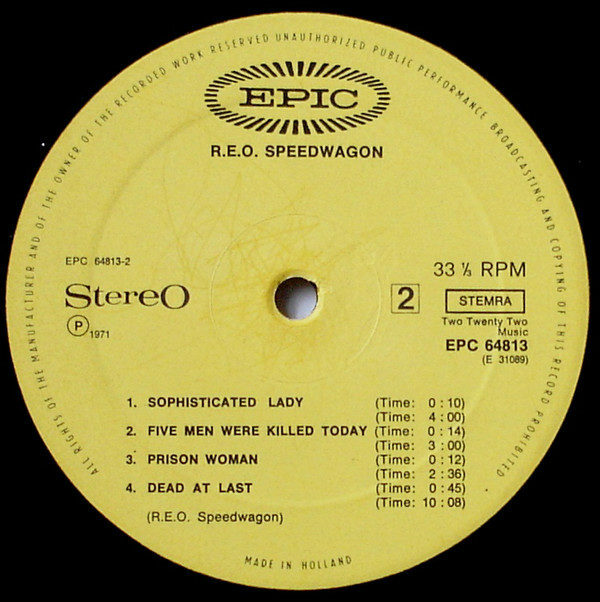 Vocals were handled by the original singer, Terry Luttrell, who lasted only one album and really sounded nothing like Kevin Cronin, the bands 2nd and 4th singer and the one whose voice is most identified with the band. Founding member Neil Doughtys piano is featured just as prominently as Gary Richraths guitar, which really lends a rollicking, boogie feel to the music, and makes it easy to imagine these guys rocking a smoky college bar. The songs are perfectly serviceable. Lyrically one or two are pretty timeless, like “Anti-Establishment Man.” You can hear more than a few hints of Richraths scorching guitar talents which would come to serve the band so well throughout the years, particularly as an antidote to Cronins somewhat saccharin balladry. 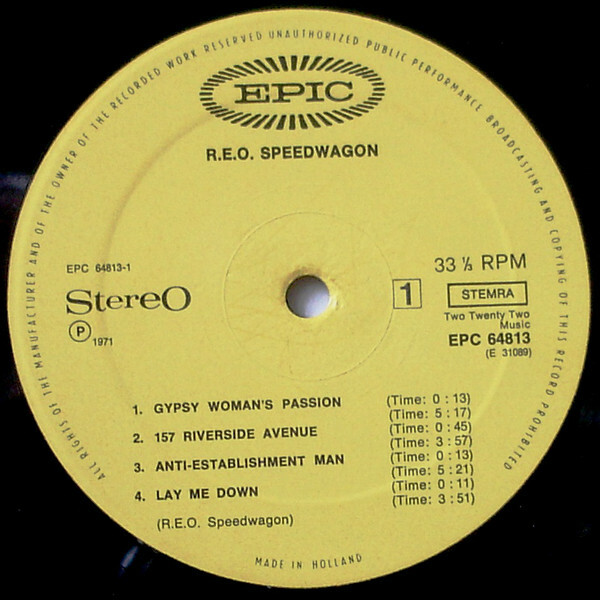 Anyway, REO Speedwagon is a fun album of rollicking good-time rock/boogie that I’d recommend to anyone looking for a 40-minute escape from today’s drudgeries. 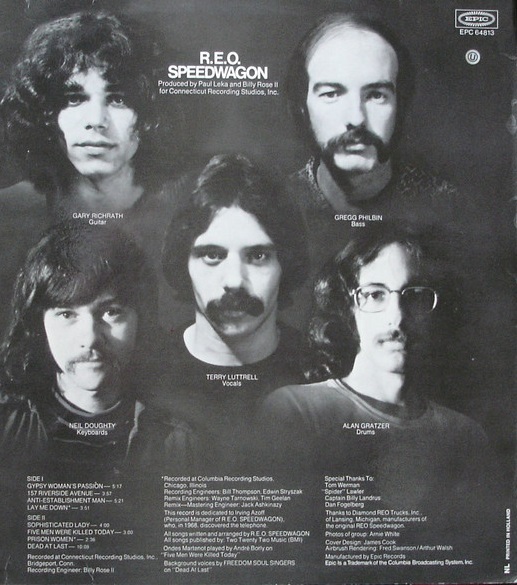 This was the first, ironically, album of REOs that I heard and there are most certainly several highlights, imo. Terry Luttrell had a unique sound to his voice, I don’t know if I’d say it was ‘bluesy’, but at least to me, a natural fit to the music that they were playing at that time. Also, if I’m not mistaken, REO had been playing for some time in the Midwest and were known to some, as well as liked, in those areas of the country before becoming more widely known, then touring more extensively across the country, too. I have many fond memories of both this album, several of the songs and the excellent music, too! ‘157 Riverside Avenue’ is definitely one of the best tracks on this album, it also was a mainstay in their live set, as well. Gary Richrath is a fantastic guitarist, and although some may think hes possibly underrated, I feel differently! Experiencing his live playing will certainly lay that perception to rest. He is one of the most skilled guitarists that I have had the great pleasure of seeing in concert, and I’ve seen more then a few! SKU: YP-2605-1 Categories: All Genres, AOR, Hard Rock, Rock, Search by Media Type, 12 "